By now you’ve hopefully read the release announcement as well as my full review of the new HP MediaSmart Server EX490 and EX495. Once I finished the review, I almost immediately started taking apart my EX495, purely in the best interest of all you readers, of course. 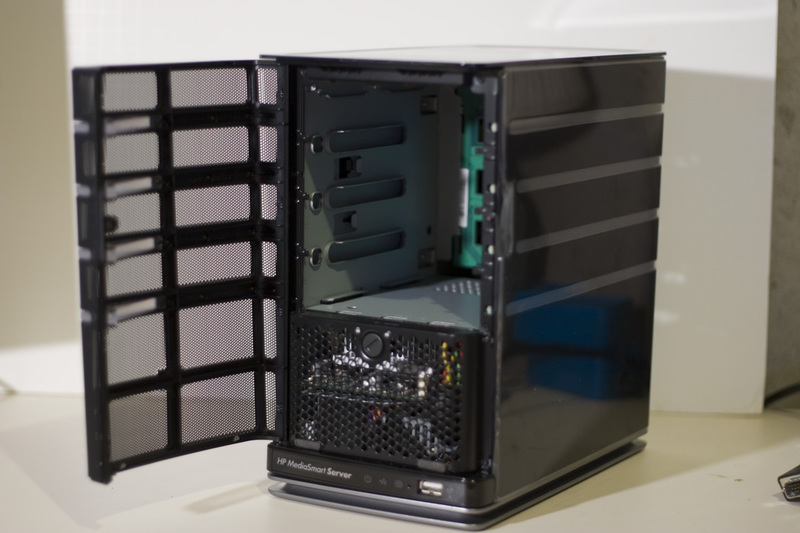 The 3rd generation MediaSmart Server utilizes the same chassis as the previous models, with the “aqua” LEDs and updated drive trays of the EX48x servers. I’ll be showing you the hardware from the EX495, however HP has told me that the motherboard and BIOS are the same in the EX490 though it does use a different heatsink to match with the single-core Celeron processor. I’ll start by showing you how to take apart the MediaSmart Server, then take a closer look at the hardware itself, and finally show you the results of my power consumption testing. Note: Please be aware that even opening the case of your MediaSmart Server will void your warranty. The first step to taking apart your MediaSmart Server is to unlock the system drive tray and remove all the hard drives from the server. 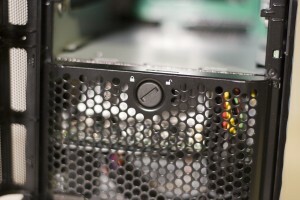 Be sure to mark the system drive as it is required to be in the bottom drive slot. A coin is useful for helping to turn the lock, and you can also lift up slightly on the drive tray if the lock doesn’t want to turn easily. 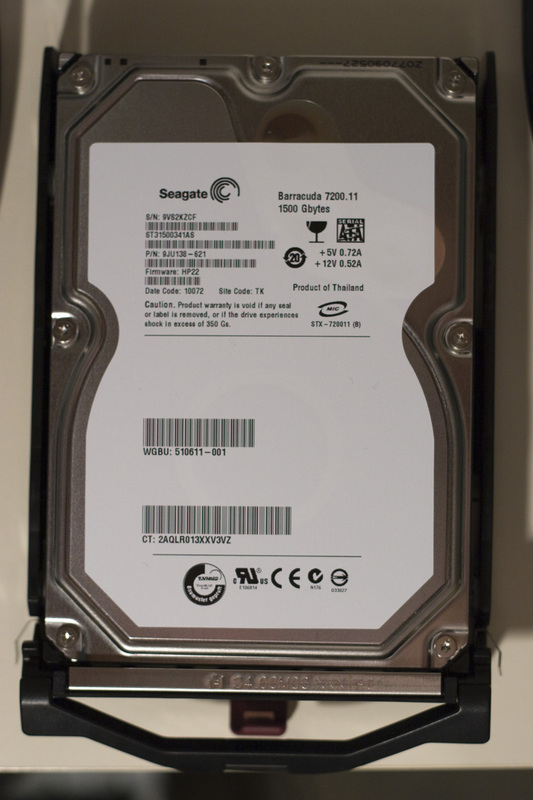 The hard drive that ships with the EX495 is a Seagate Barracuda 7200.11 with 1.5TB capacity. The EX490 has a 1.0TB drive, and I suspect it is the same Seagate Barracude 7200.11. After you’ve got the drives out, take a #0 jewelers screwdriver and remove the two tiny screws on the right side of the lower shield. These screws are tiny, be sure not to lose them. 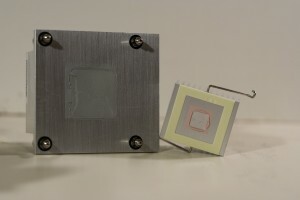 You can then pull out the right side of the lower shield and then pull it loose from it’s tab connectors on the left side. 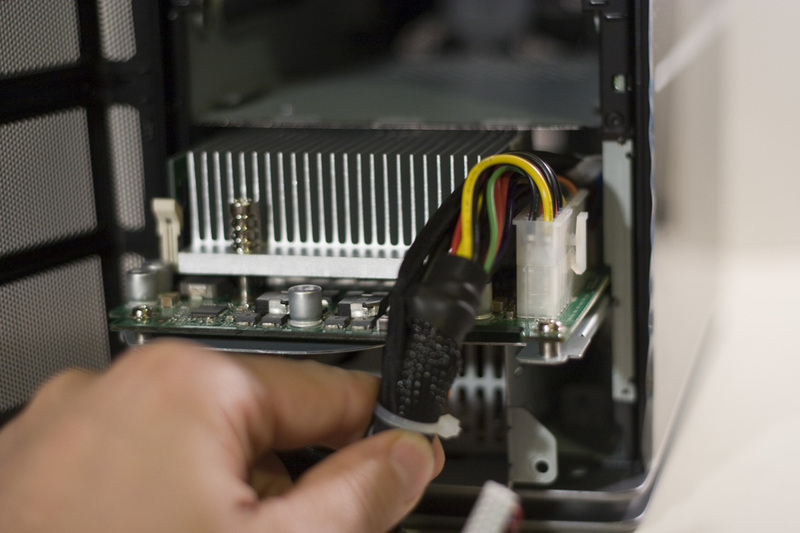 Now disconnect the electrical connector and set the lower shield aside in a safe place. Next we need to remove the top cover. 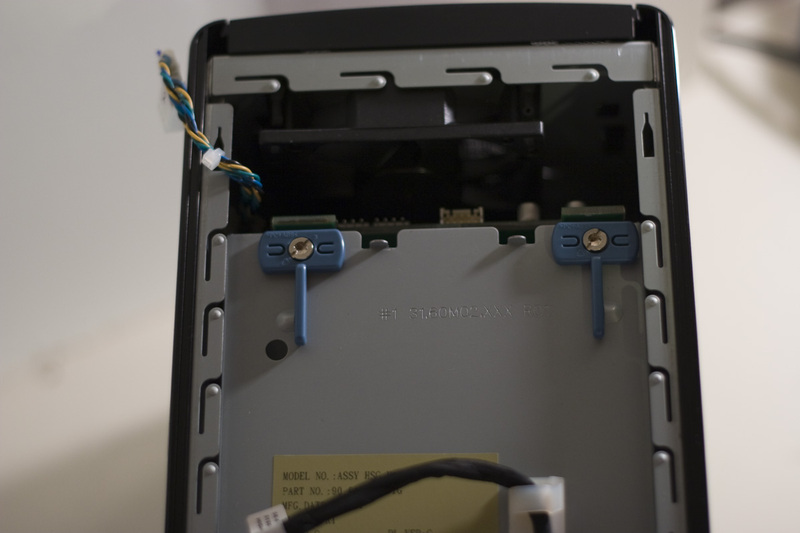 There’s a small plastic clip located inside the drive bay area, press up on the plastic clip while putting pressure on the rear of the top, pulling it towards the front of the server. It should slip free relatively easily and can then be lifted off the top. With the top cover removed, you’ll next turn the blue plastic clips that retain the backplane, and remove the LED board cable and two fan connectors. 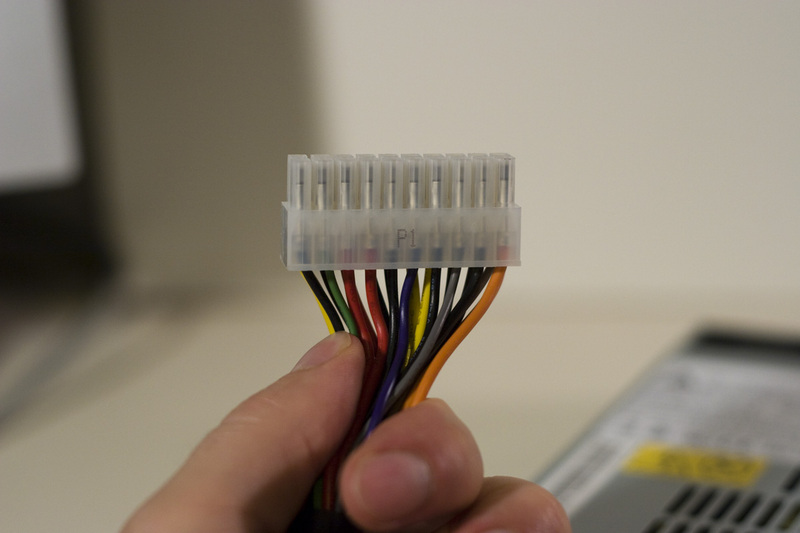 Tuck them to the side out of the way so you can remove the backplane. Removing the backplane is one of the more tricky parts of disassembling the MediaSmart Server. I’ve heard of people knocking the capacitors off, so be very careful during the step. I’ve found that the best way to remove the backplane is to reach inside the drive bay area, place your fingers underneath one of the air gaps in the backplane board, and lift gently while putting a small amount of opposing pressing against the top of the board to keep it from popping free too aggressively. Note that the board is retained by metal tabs, you’ll need to maneuver it free after you’ve popped it free from the motherboard. 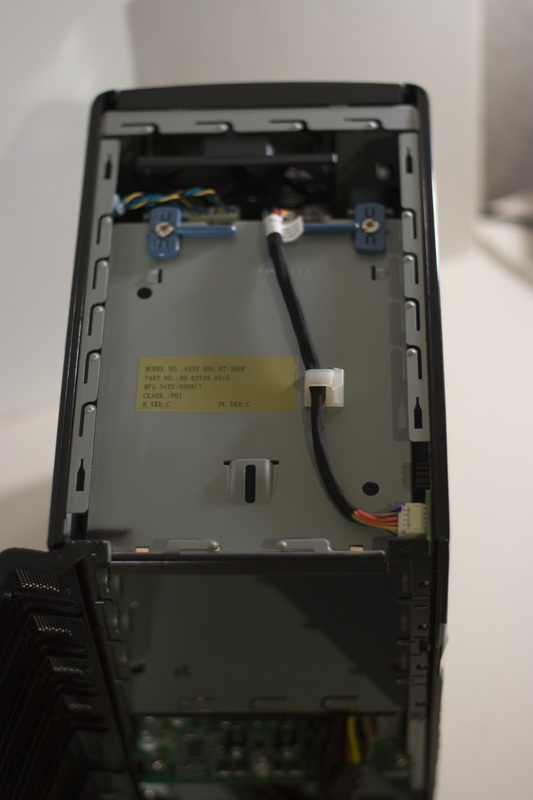 Return to the front of the server, and remove the two screws that hold the motherboard tray in place. There is one screw on either side of the tray, and once they are removed you can simply slide the tray out of the front of the server. Congratulations, you’ve now got the server apart and have full access to the motherboard, CPU, and RAM! Now let’s take a look at what’s new from the previous generation servers. The motherboard is the same size and general layout as previous versions. The debug header still exists near the Southbridge (large Intel chip without a heatsink), so those of you that have purchased one of cakalapati’s keyboard/video/mouse cables will have direct access to the system if you need it. 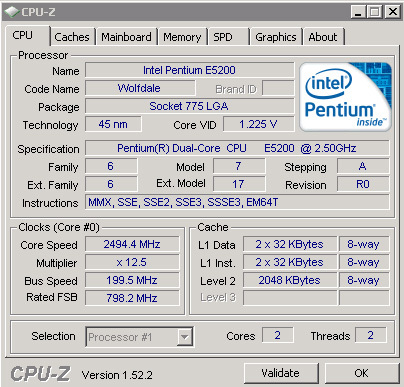 The processor in the EX495 is an Intel Pentium Dual-Core E5200, and runs at 2.5 GHz at full speed with the ability to throttle down to 1.2 GHz when idle by decreasing the multiplier from 12.5x to 6.0x. 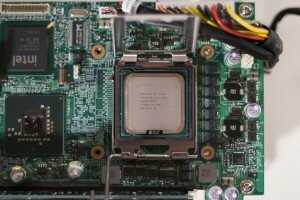 This CPU is manufactured using a 45nm process and is rated at 65W TDP. 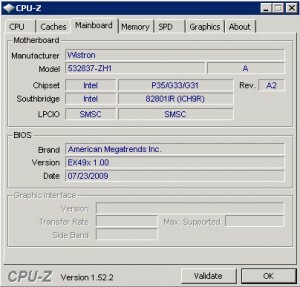 The motherboard uses the same Intel G33 Express Chipset that was used in the EX485x series servers. An important addition is the new Silicon Image SiL3531 chipset that provides support for Port Multipliers over the eSATA port and will allow you to connect an enclosure that holds up to 5 drives for further storage expansion. 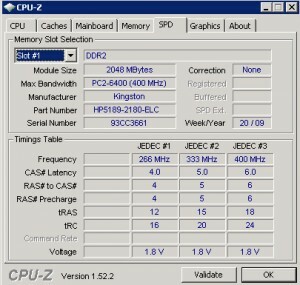 The memory in the EX49x servers is 2GB of DDR2 PC2-6400 manufactured by Kingston. I removed both of the heatsinks, and found the usual thermal interface material on the Northbridge the CPU looked better and wasn’t overloaded with thermal compound as it had been on my EX487. If you’ve the server this far apart, you might as well take the opportunity to clean off those heatsinks and apply some of your favorite thermal compound such as Arctic Silver. I also noticed that the heatsink uses the same spacing for it’s mounting posts as previous models, meaning this is a non-standard design and will not be easy to replace. I’ll be very interested to see how the heatsink on the EX490 differs, if at all, as HP has indicated. 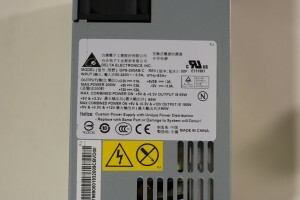 The power supply is new for the 3rd generation MediaSmart Server, it is much quieter and really contributes to the near silent running of the server. 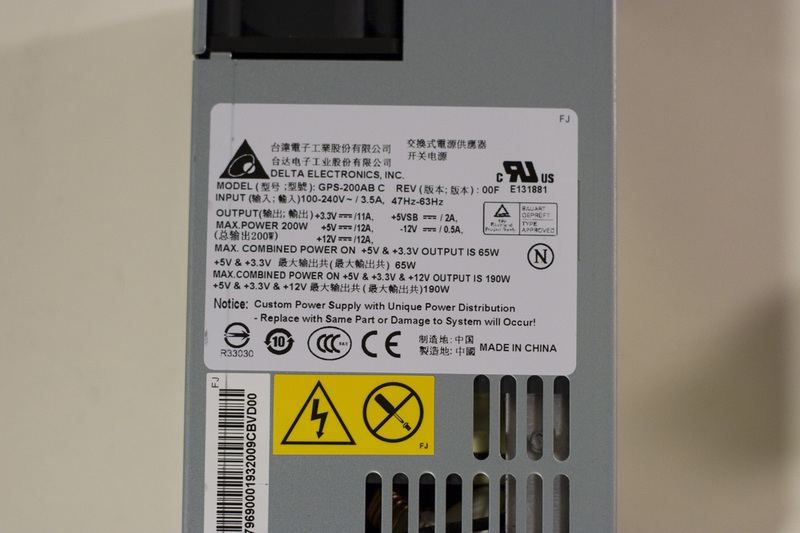 The power supply is a 200 watt model manufactured by Delta and uses the same non-standard wiring as we have documented in the Wiki. It is attached to the motherboard tray by 3 screws on the rear. Prior to disassembling my EX495, I plugged it in to my P3 Kill-A-Watt to measure the watts consumed with various numbers of drives installed. I also measured the server in these configurations both while idle and under heavy load from the stress test of the Prime95 utility. I used the stock 1.5TB Seagate, two 1.0TB Seagates, and a 750GB Seagate drive. All drives were added to the server and the system time to stabilize before I recorded a measurement. No “Green” drives were used in these tests. Remember that these stats are for the EX495 and that the EX490 will be a little bit less with it’s lower power Celeron processor. You can visit my review for the Power Consumption specs provided by HP. 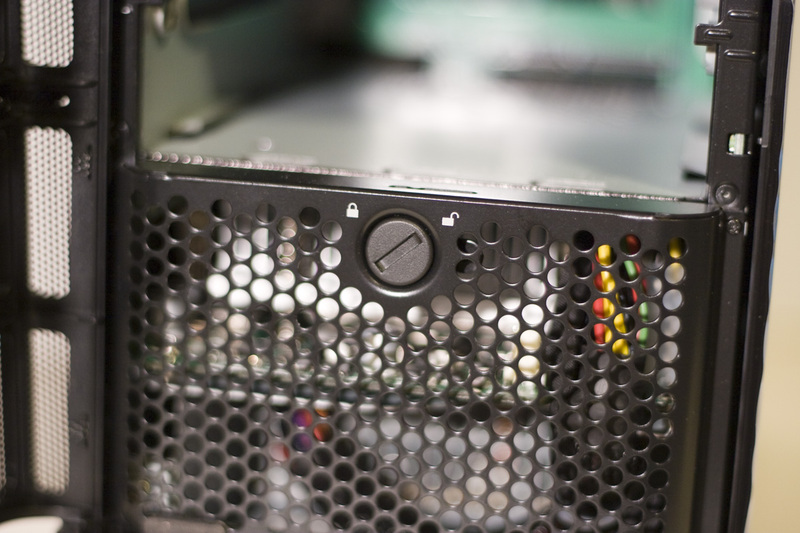 This wraps up our look at the new HP MediaSmart Server EX490 and EX495 hardware. In my next article I’ll be showing you the BIOS of the EX495. If you have any questions or would like to see anything else covered, please let me know. So the question is, which CPU will give me enough extra horsepower, with out worrying about heat and possible fan speed noise increases while under load? I wouldnt mind having VT so I could run other Virtual OS’s to test out etc. I’d like 4GB too, and I see Mushkin thrown around a lot. So far I’m only seeing the 4G kit for sale which is really 2x 2GB sticks. While we’re at it, I wouldn’t mind having the VGA Adapter too if anyone knows a cheap place to pick one up. I’m happy that someone wrote drivers to get the LED Drive lights, and Health light working in WHS 2011! I’m happy using StableBit Drive Pool so far as well. Another great in-depth examination of the new MSS. Thanks Alex. Thanks for the interior/dissection shots! Much Appreciated! Thanks for dissecting this so quickly. Just a couple of questions. 1. Is the new power supply interchangeable with all prior models of the EX4XX line? 2. Is there an HP part number for the power supply for end users to order? 3. This may be pure speculation, would the new power supply teamed with the older hardware be quieter than the old PS? 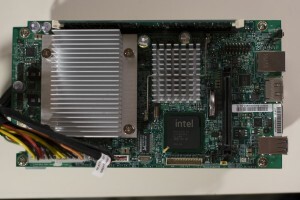 @Texas-Hansen – The heatsink is actually not very different from previous models. The posts are the same placement as previous ones, meaning it’s a custom design and not easily replaceable. I’ve updated the review above to reflect this additional detail. I did notice the fins are a little thicker and there are fewer of them, but I’m having a hard time imagining how the EX490 heatsink can be very different considering the EX495 heatsink looks so similar to the EX48x heatsink. I can share the idle and loaded temperatures, I’ll gather that tonight hopefully. I doubt the power supply fan at the rear has any significant effect on heat removal, but it probably is a bit more efficient. I also think we may be reading too much into “new fan control/cooling system” – I suspect this is marketing speak for the CPU throttling and default fan speeds that are likely defined in the BIOS for the two different models of server. The chassis is the same, the case fans are the same, the only difference I can think of would be fan speed, thermal, and CPU speed profiles. 1. 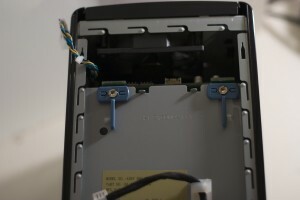 As I mention in the review the connector is the same, and the motherboard tray is likely the same or very similar since the chassis is the same. I’ve not tested but I suspect it would work with at worst only minor modifications required. 2. I only saw the Delta part number, not an HP part number. 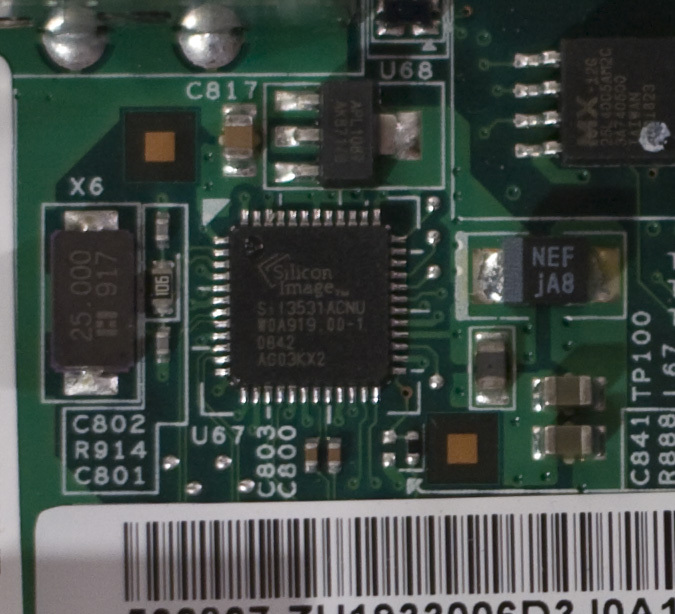 HP has also not made spare parts available for the MediaSmart Server, especially not for internal components that are not considered to be user serviceable. 3. I believe it most definitely would be quieter, as from my experience the old power supply was the most noisy component of the previous generation servers. Alex, can you please find out the size of the internal flash. 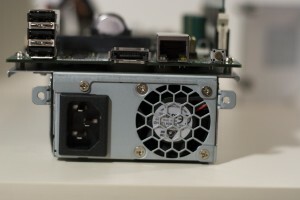 The internal flash does not exist anymore, the Server Recovery process is now performed by directly connecting the PC to the Server via network cable and the server has a PXE boot mechanism to retrieve the recovery image. I’ve not tried this yet, but imagine it would reduce the frequency of Server Recovery “Cannot find server” issues. I *just* bought a 480 this week to replace an ailing 475 – was on sale for $415 CAD. Still moving the drives over… Wish I had known about the 495! Question: will the 480 throttle down the processor if I swap for an Intel E5200? Or is this specific to the 495? Hi Chris, I’d recommend you check out this forum topic that is all about upgrading the CPU in the EX48x servers before you buy a processor to do an upgrade. Thank you for the in-depth review – it is great that you can make comparisons between the EX48x series and the EX49x. The most exciting feature (for me) is definitely the new PSU – I have been contemplating a PSU fan swap due to the noise levels, but HP seems to have given us an easy swap option (hopefully). If you get a chance, would you please check to see if the new PSU would fit perfectly into the EX48x series? If that can be confirmed, I’m sure a lot of people would be interested in swapping them out. 2. Is there any hardware RAID in the BIOS or do I have to use the “duplication” function? With all my photos entrusted to this device, I believe in safety first. I currently use a PCI SATA RAID controller but it appears there are no slots in this device. Other suggestions welcome. @Pat, I need to take apart the EX495 again so I’ll take a closer look at the fitment of the new power supply into the previous generation servers. @Mike – Thanks for your feedback! 1. The drive trays are proprietary from HP and we’ve not found a source of them. The server comes with 4 so you won’t need any more unless you lose or damage one. 2. If you’re not interesting in the Duplication feature, I have to question why you are interested in Windows Home Server and the MediaSmart Server? It can be argued that Duplication is “more safe” than RAID, in that your drives are NTFS formatted so you can always remove the data even if the motherboard dies. 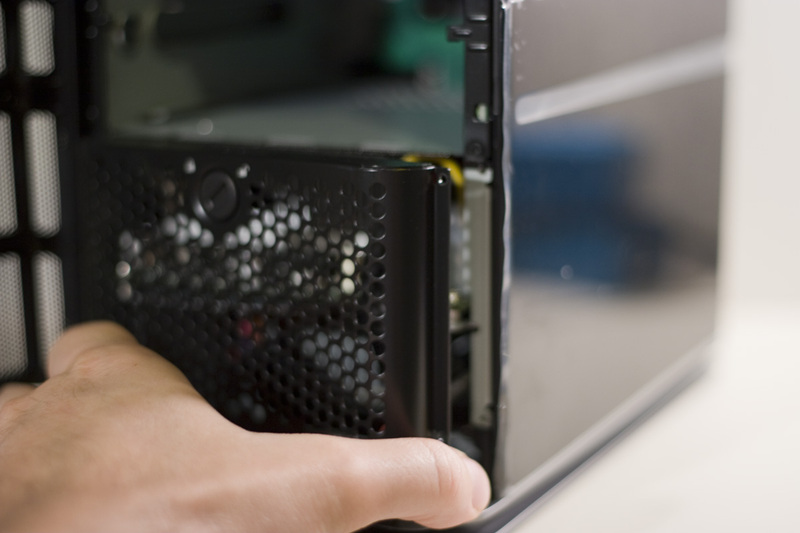 If your hardware RAID controller dies you have often lost your data. My “other suggestion” is to learn more about Drive Extender (the duplication technology) and see if your confidence increases to where WHS is the right solution for you. The forums here have a ton of info. Thank you very much – that would be great – I don’t really know how difficult it would be to obtain the newer PSU, but I guess the first thing would be to see if they are interchangeable. Thanks for the prompt response. Great news about the trays coming with the empty bays. Problem solved. As for RAID vs Duplication, you are probably right. Duplication has the additional benefit over RAID in that I can select what gets duplicated so the MP3′s of my CD collection won’t be duplicated but Photos will. As soon as the new server is available here in Australia, I am off to buy one. Great, thorough review from a professional. I love my 1st generation HP MSS, thinking about getting a new one. Keep the info coming. Good job, Alex! Thanks for the great initial review and in-depth follow-up. As a 485 owner, I would be curious to know if there is any confirmation on the EX49x series being confirmed as capable of an upgrade of the RAM beyond 2GB, and if there is any confirmed news on the status of the viability of an upgrade to WHS v2 when it ships? 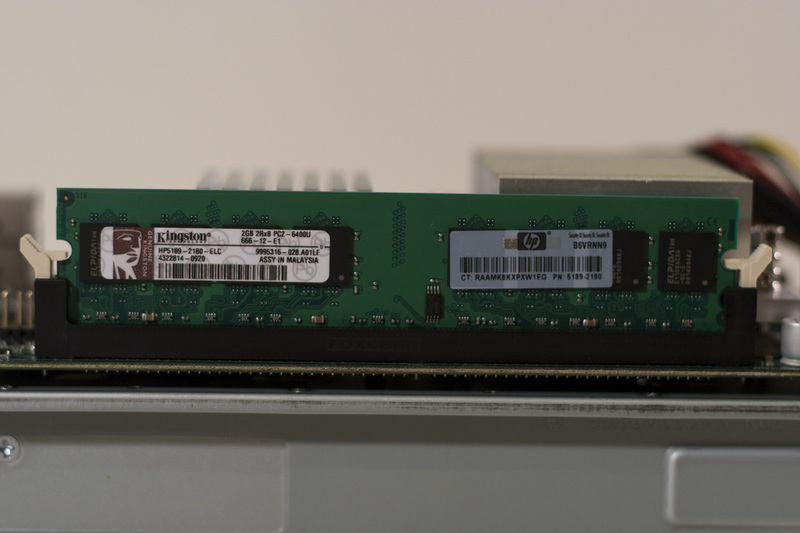 No one has upgraded the memory in the EX49x server yet to my knowledge, however previous versions of the MediaSmart Server all accepted 4GB sticks of RAM so I don’t anticipate any issues. Considering there’s been no real news released about WHS v2, no there’s no status update on viability of an upgrade. Personally, I don’t expect any OEMs to officially support upgrade paths from WHS v1 to subsequent releases. 1st: When upgrading can I put HD of different capacities? I know that in RAID systems, the drives have to have the same size (excluding the JBOD or Drobo type NAS). 2nd: Is it possible to replace the HD that comes with it and reinstall all the software? The questions are more or less answered but I would be thankful for a black on white answer. Hi Alex, the answers are yes and yes. You can add any size SATA drives to the Server. You can also replace the existing system drive that resides in bay 1 with a different drive, and reload the OS with the included Server Recovery DVD. Thank you for the fast answer!!! I made up my mind and will buy one!!! It seems a very interesting product. Thanks for all the info your provide us. On upgrading the memory on the EX495, I want to make sure it takes a regular DDR2 DIMM and not a FB-DIMM (server memory). Can you verify that? Thanks for your comment. 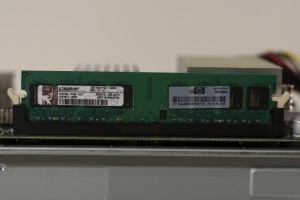 All the MediaSmart Servers use standard DDR2 DIMMs. Will it use FB-DIMMS? I have a 4GB stick that doesn’t have a home. 1. Am I reading it right that the max memory is 4gig? If so that is kinda small for a server. Does it support ECC memory? 2. Can that mobo support a quad-core proc? 3. Will Dell be making one of these WHS products in the future? I am an enthusiast and I am looking at getting one of these servers when I get home from Iraq in the spring. 1. 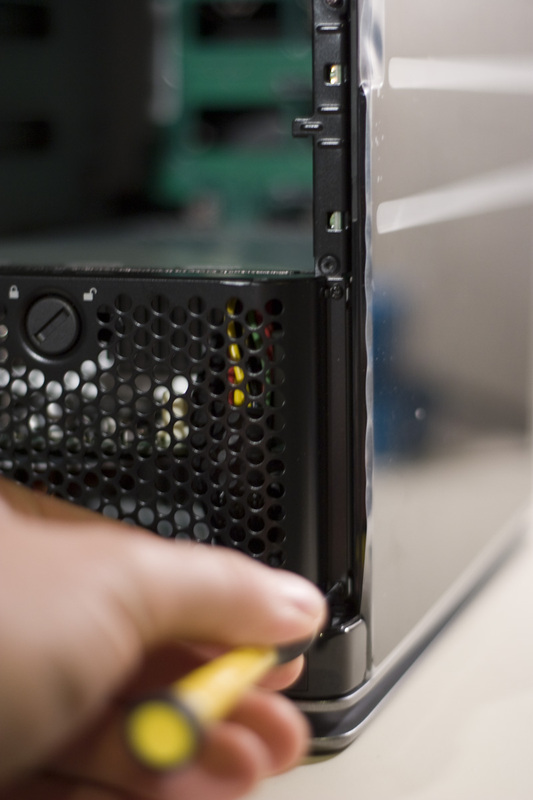 This is a home server, not a data-center workhorse. It does not support ECC memory. The memory is also not upgradeable without voiding your warranty, as it’s meant to be a home appliance. For most uses the included 2GB will be plenty. 2. Perhaps, though heat will be your enemy. People have successfully upgraded to a much faster dual-core, see this thread for more on that. Definitely stop by the forums upon your return and let us know what you get! With regards to using an SSD as primary drive, I have not succeeded with an Intel X25-M 160GB, as the server is not found during the setup-process. This might have something to do tirh the BIOS-setup, where I have to choose “IDE” instead of AHCI. 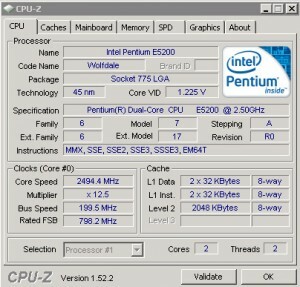 You mention in this article that you will get back to the BIOS of the EX495, but I have not found any? Is there some possibility to get the sequence needed for changing this without the need of a screen? (Which keystrokes are needed after “DEL”/F1? Thanks for the kill-a-watt stats but I haven’t seen anyone post what they’re seeing when the EX490 is in sleep. HP reports 1W. I’d like to see that stat confirmed. What specific items are you looking for? There’s hasn’t been much request for this so it’s been low priority. I forget it. Wich is the motherboard? is it compatible for a quadcore processor? 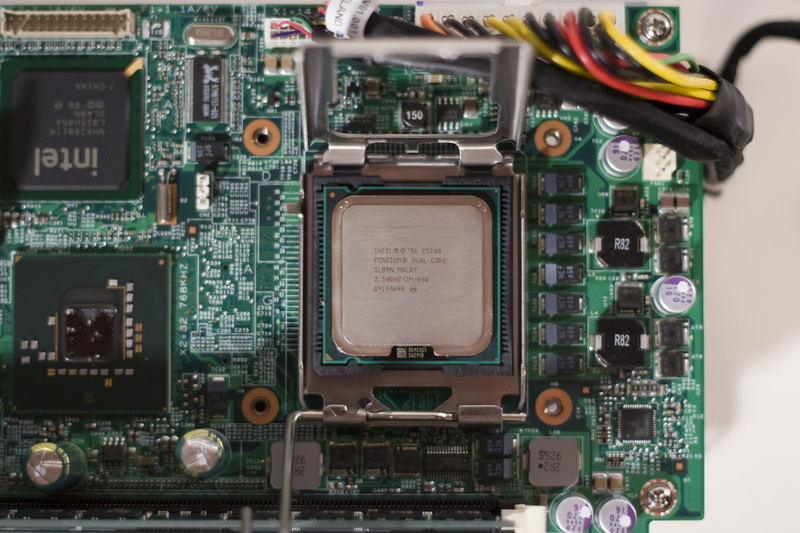 There’s a lot of discussion here in the forums about upgrading the processor in the EX49x servers, you can find the answer to your questions there. First off thanks for a nice WHS, I have spent the last few days pursuing your site and have enjoyed it. I have the dreaded EX470 power supply failure. I called HP to get support and essentially there is no more support. They no longer have the Out of Warranty support. I even asked to purchase a new PS from the EX495 since it also seems to have the non-standard ATX plug. Again, the answer was NO. My EX470 is less than 2 years old, pretty poor customer support. Everyone buying these new boxes should consider this as you will probably be in the same situation when this one is end of life. Lots of non-standard, no parts. I just purchased a EX490 and out of the box it seems like it’s running like mad. There is no slow down of the CPU it’s always running at a high percent. I would exspect this when you are backing up or something but when it’s just sitting there? Any idea’s ? Next do a search and you’ll find some discussions in the forums on how to troubleshoot. Basically you need to figure out what’s consuming the high CPU. Alex, I would understand if I actually started using the server like music,backups ect.. I loaded the software on my pc and tuened the server on and it did a update and the cpu has been going 90-100% ever since. maybe thats normal for this processor? maybe it need more memmory? but this sits next to me and its quite noisy because its running fast all the time. I see problems in the future like cpu crashing if it runs all the time like this. It reminds me of the sound a pc makes when its defragging a drive? but serious I havnt even done a backup or anything? Can there be something wrong with this machine? I doubt there’s anything wrong with the server, but you’re just guessing until you figure out what is causing the high CPU load. My link gives a starting point, and as I recommended previously, searching in the forums will give you lots more suggestions and fixes. I’d start in the EX490/EX495 forums, and you can get excellent troubleshooting assistance from the community there. 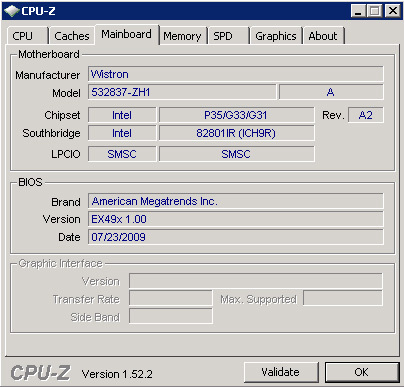 Alex, I uninstalled Mediasmart and the cpu is now running at 2% do I nned that software or is there a diffrent version out there? You haven’t told us what your needs are, so I have no way of knowing if you need it. The MediaSmart software is what differentiates your MediaSmart Server from generic Windows Home Server. It provides the Media Collector, Video Converter, Twonky media streaming, Remote Media Streaming, Photo Publisher and Viewer, and related Server Console tabs. The only way to get the software back on is by performing a Server Recovery. @BG – I have tested sleep mode and as HP states it is 1 watt on the Kill-A-Watt. Hey Alex, love your guide. Thanks to it, I was able to able to swap my EX490 Celeron with a powerful, E8400 processor. I just hope that the heatsink could dissipate the heat since it has the same TDW rating of the E5200 which use the same heatsink. 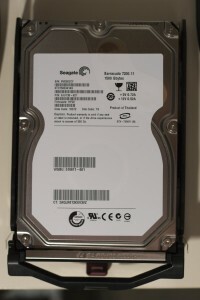 I want to swap the OS 1TB Seagate 7200.12 with a 2TB Western Digital (EADs for OS drive), what approach to do so in your opinion? Should I clone using a clone software such as Acronis or Norton Ghost? *P.S I actually receive my EX490 today and I didn’t even turn it on. Instead, I load your guide, and start to take it apart, then pops the E8400 in, put everything together, hit the switch and pray. Voila it works! @Checkmate – Awesome, glad the guide helped and thanks for the feedback. Since your server is brand new, if you’ve not moved your data yet I would simply do a Factory Reset onto the new drive, this will erase the entire system and reload the OS. If you want to clone the drive this guide will help you. Let us know how it turns out. Glad I stumbled upone this writeup, i’ve upgraded the memory of my ex495 and awaiting to upgrade the CPU soon, any recommendations ? Harry – There’s some great discussion in the forums on CPU upgrades, there is a wide range of compatible processors. Everything is up and works perfectly. As you suggest, I just swap my 1TB Seagate HDD with the 2TB WD EADS HDD. Turn on my laptop, connect the network cable directly into the EX490, and turn it on. The EX490 automatically boot into recovery mode. All I need to do is to pop the CD in, clicking next 2 times, and wait for 30 minutes. The newly upgrade E8400 run at 50c at idle (my room temperature is 23) and 53c when I put it on the server shelve. So I expect the temperature to jump to 60-65 on medium load, which is a bit high, but it is still at acceptable range. The EX490 with E8400 run brutally fast! Beat my Acer H340 to death, login to control panel takes 3s whether my Acer H340 taking 38s. Although my Acer is currently managing 9TB out of 12TB of capacity. Both runs deadly quiet. The HDD temperature (same WD Green) on EX490 range from 38 to 44, while on the Acer H340, it’s from 44 to 49. Both are measured in reasonable low activity. Now I’ve installed a total of 8TB into my EX490, I’ll transfer data from my Acer H340. I have a special application for my EX490. Thanks you Alex, for your precious advice. Without them, it should have cost me hours of googling. Hi Checkmate, thanks a lot for your comments and sharing your experience. It’s rewarding stories like this that help keep me motivated. Definitely post up again here or in the forums and let us know how you get on with your new server. As we all know that HP EX48x does not support eSata Port Multiplier. Has anyone looked at hardware/software hacks/mods in order to add port multiplication? or is it even possible? The best solution I have seen so far is to use USB. Do you have any comments?. francis, to my knowledge there is no known way to get port multiplier support working with the EX48x. The physical hardware doesn’t support it and there’s no expansion slots to add a card. Just ordered a EX490 and need to buy drives. Can this server benefit from faster 6Gb/s drives or will performance be the same if I use a 3Gb/s drive? DZ, the server utilizes SATA2 drives, which is up to 3Gb/s for that interface. Dennis, it will obviously depend on the drives you have installed and whatever else your server is doing, but WHS and the MediaSmart Server are generally regarded as having quite good performance. SmallNetBuilder has some numbers in their review of the earlier generation EX470/EX475 if you’d like to check that out. Question? My EX490 has 6TB 2,2,1,1, I never see any of the LED’s do anything other than stay lit blue all the time, simply steady. Never a blink on any of the drive lights or the three status LED’s at the bottom. Is this normal? I would like to see HDD activity, or even network activity from the LED’s but nothing, just lit steady all the time. JohnM, that is normal behavior, the LEDs do not flash for HDD or Network activity. Thanks for the guide. Just picked up a cheap 490x on cyber monday (day before hp announced they’re dropping the line). Loaded it with 8TB and just upgraded the CPU to the e5700 (3.0ghz, 800mhz fsb, 2mb cache). I would have liked to upgrade the ram to 4Gb at the same time, but couldn’t justify it quite yet. I’m using my home server for storage for the family, but also streaming movies to all the tv’s in the house (media players), ftp, rdp, and web access remotely and I have a subversion server running for my consulting work. I’m loving this device, even if HP is canceling it. The upgraded cpu makes the world of difference. The performance difference is night and day. I barely notice a difference in temps as well, just a degree or two most of the time. I Bought a EX495 on Black Friday to replace my Launch EX475 (who found a good home with my buddy) .. Added 4Gb and E8500 running at 3.16 duel core.. Fully loaded with 4 2TB drives .. and just added the Mediasonic 3.5-Inch USB 3.0 and eSATA loaded with various 1 and 1.5 TB drives via. eSATA bringing it to a total of 15.1 usable storage .. I have done the same upgrade, and it shut down all on it’s own last night. I am wondering if I should even bother with tuning bios (I haven’t done anything with it yet) and taking more care with thermal paste, it might be of no use. The temperature now is just over 60 degrees C, and this is with only two hard drives in it. If anyone has any suggestions, I am all ears! I’d recommend checking your thermal paste again. With my dual core 3.0 ghz cpu and 4x7200rpm 2tb drives, mine idles in the low-mid 40′s and never gets above 60 fully loaded. More isn’t better. make sure you fully clean off the heatsink and apply a thin layer of paste to the chip. I use the artic silver paste (a single tube has lasted me for years). All right, thanks for the feedback! The temperature has dropped to low 50′s now, maybe the paste just needed some time to work. At least now I know what to try in case it fails again. 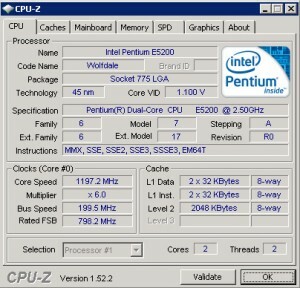 Do you know if there are any bios settings that should be adjusted after upgrading CPU? It is running at 3.16 Ghz so I guess at least some settings are at “auto”. I don’t think you ever did the part 2 to this with the BIOS screens. I was wondering if the EX49x has options in the BIOS to enable RAID? I’d like to use some of the advanced format 2TB drives, but don’t want the hassle of the potential issues with WHS v1. So if the EX49x supports HW BIOS, then I’m thinking Vail RC with RAID 1. If not, I’ll build a new box. There is no hardware RAID in the MSS. It’s been quite a while since I was in the BIOS but I believe even if the RAID mode settings are made available the RAID configuration utility is not included. With the Intel chipset you may be able to just configure the RAID in the OS with the appropriate Matrix driver, however I’ve not tried it. I installed the Intel software actually right after I wrote this. The software won’t see RAID unless the BIOS option is set to RAID. It will only display AHCI. I’ve seen this on regular PCs too. “If” the setting was available to turn on in the BIOS, one could install Vail on one HDD, install the Intel software, and then remote in to Windows and add the other HDDs into the raid via the Intel software. I’ve done this before on regular PCs. However since I don’t have the cable I can’t check. Your thoughts would be greatly appreciated. I will update forum with BIOS question, maybe a screen shot or 2 if it’s possible to post JPG. with the current WHS2011RC build, it you have 4 drives in the EX49x, and right click on Computer and select mange, you will have an option to format the 3 drives as RAID 5. Using this option is the software method I assume, which, from what I’ve read is resident on most versions of Windows and other OS’s. Do you know if I still need to enable RAID in the BIOS to do this? BIOS is currently set for AHCI. Or is that setting for motherboard RAID only? I was able to get into the BIOS using a debug board and the option is there for IDE, ACHI and RAID. I think, from what I’ve read in an Intel MB manual, to use motherboard RAID, I need to set the BIOS for RAID, F6 during boot to load the RAID driver (not sure where to get this for the EX 495, not that I’ll be needing it anyway) and then run the RAID exe once booted. For Windows Vista/7, I don’t need to do the F6 step since they already contain the driver, so I would assume that its the same for WS2008r2/VAIL/Aurora. I have the ex490 which shipped with the celeron 450 CPU and 2gb of RAM. Does any one have any recommendations for a 4gb stick that would be compatible? I might do a processor upgrade but would like to start with just the memory upgrade and see how things go. Ian, see this topic for discussion on memory upgrades. Thanks Alex. Interesting… The debate seems to favour faster 2Gb RAM rather than 4Gb RAM as that only seems to be available (or at least is inferred) at speeds equal to the 2Gb RAM that came with the ex490 in the first place. I had wanted to do the RAM first as it seemed a less daunting task than the CPU switch, but I’m beginning to feel that its the CPU I should do first not the RAM. If everything else is equal at 2Gb I guess we are talking about the performance improvement from 667 to 1066 (thats the fastest I can see from a quick search) I wonder what that would translate too in a average speed increase across backups and video streaming etc etc… ??? The discussion in the forums is the best info that I’m aware of. I’ve never upgraded the CPU in any of my MediaSmart Servers, the dual-core EX495 is perfectly adequate for my use which is storage, backup, and streaming. If you’ve got the EX490, I would upgrade the CPU before I would put a 4GB memory stick in, then see if you have issues with performance. Although I just noticed that the CAS latency was 7 in the two 1066 options I found as opposed to 5 in the 800 speed models. I decided to downgrade again to the original E5200. E8500 was running ok, but temperatures on light load (file compression/uncompression) quickly ran up into the high 60′s to low 70′s.. Which made me feel a bit uneasy about the whole situation. Having 14TB (4 x 2TB WD Green + 5 x 1,5TB Seagate in external closure Raid 5), I figured the speed difference was not worth it in the end. I am not using video conversion and the heavy-duty features anyway, so I guess my advice here is to use a configuration you feel comfortable with. Constantly trying to keep an eye on temperatures will not make you sleep better at night. On another note, I replaced the system drive in my X510 and decided to install Windows 7 just for kicks (I have a VGA/Mouse/Keyboard adapter). First impressions are really good, it runs much faster than WHS actually. Of course, this forces me to change backup scheme, and it kind of defies the whole reason for buying a server like this in the first place. For what its worth when i read across the various topics and forums the e6800 seemed to be the sweet spot for ‘bang vs buck’. Plus it seems to cause no major difference in running temp assuming its installed correctly. I have to confess I have the ex490 which has the Celeron 450 so I would see more of an improvement than you and your e5200. The refund or ebaying the e8500 should cover the cost easily!!! Just replaced the fan of my EX490. Here is the instructions FYI. Nice guide, thanks for sharing! Alex, I was not able to pull the motherboard out of my ex495. I followed your instructions precisely. I just cannot budge it to pull it out! I fear there may be something else holding it in place. Any ideas? Most likely you missed a step, I encourage you to go back through the process and verify ever step. 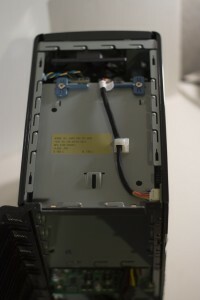 Make sure you removed the backplane, the two black screws from the front “chin”, and the two silver screws that hold the motherboard tray to the case. Thanks for your quick response! I didn’t miss a step but you gave me assurance it would come out. So I discovered that the right side of the Motherboard had to be pushed down slightly so it could slide thru the slit in the right side of the case. Also watched video that John Zajdler suggested. All very helpful. I now have successfully installed a dual core E7500 and the Mushkin 4GB memory strip. It all seems to be working fine now after 4 hours. It feels faster than before. I wouldn’t know how to measure the improvement. I got the E7500 for 90 bucks at my local Microcenter. The 4GB memory costs about the same, surprisingly. 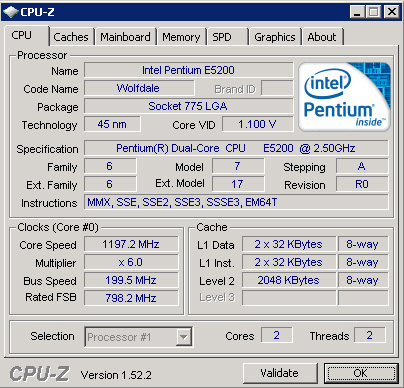 After several months , I am very happy with the Intel E7500 and 4GB Mushkin memory strip upgrades to my EX495. Recently, I installed WHS 2011 with help from Alex’s article. Some hiccups in beginning but after 2 weeks, system is purring. Backs up my Win7 desktop and laptop quickly but 1st backup took long time. First is full backup followed by fast backups of changes. Streams media perfectly. Easy interface to learn. Does the EX495 have a cmos battery for time maintenance? Maybe this is not the place, but I installed WHS 2011, which works fine until I have a power failure (no graceful shutdown and no UPS). When I start the server up after a power failure, the time is messed up- Jan 1, 2002??? Then, I believe, this causes my server certificates to be out of date because 2002 is not in the date range. Then, this seems to cause problems when I start up Launchpad and Dashboard, messages like, The server appears to be offline, would you like to start in the offline mode, or messages about the certificates being out of date or not there. Or Dashboard does not start at all on the server with no error message. I have been able to clear the certificate problem up after help from Microsoft, and all is fine until the next power failure. The tricky part will be setting the time correctly in the BIOS, you’ll need a debug board to do that. A possible way to test if the battery is dead would be to shut the server down cleanly, unplug it from the wall for a few minutes, then plug it back in and see if the time is messed up again. Thank you. Yes the CMOS battery needs to be replaced. I did your test, shutting down EX495 cleanly, unplugged it from the wall, waited 5 minutes, plugged it back in, started it up, and checked the time, showed Dec 31, 2001!!!!! Afterwards Dashboard would not start up and application event log showed Exception code: 0xe0434352 for Dashboard. I did not see the CMOS battery in your photos of your closer look. But I will follow your instructions to get at the motherboard and look for it. Further with the Exception code: 0xe0434352 Dashboard starting problem caused by the CMOS bad time which caused the certificate problem due to out of range date. To fix this now, I set the correct time using Control panel Date and Time then corrected the unobvious certificate problem using the certificate manager, etc. After replacing the CR2032 battery, I still have the time problem when I disconnect the power cable and startup my EX495. You are correct about the tricky part of setting the time correctly in the BIOS. I assumed it would get set in the control panel DATE and TIME. And by the way, the old battery tested good, also as you suspected! So something messes up the time in the BIOS. Will the debug board allow me to connect a monitor and keyboard and to boot into the BIOS as on my client computers? So How do I get a debug board to change the BIOS time? Would a USB KVM switch allow me to connect monitor and keyboard to my HP EX495 with Windows Home Server 2011? Connect via USB to HP EX495 then connect monitor and Keyboard to it. What a boondoggle! For my EX495, I bought and installed the debug board with VGA, keyboard, and mouse that you suggested. When I Unplug for a minute or so and then start up and press the Del key to get into Bios update, the date is Dec 31, 2001, I correct it to current then F10 to save and exit BIOS. After a few minutes I shutdown normally, unplug for minute or so, replug and startup. Again the time is Dec 31, 2001. Do any other EX495 owners have this same time-date startup problem after their machine has been unplugged? battery in backwards? I put it in same as the original. My EX495… perfectly timed, 3 months out of warranty has all of a sudden started locking up about 20 minutes after i power it up. I took out all my drives and ran chkdsk on them and they all come back fine. I have been looking and found some blogs about power supply issues. I was wondering if you know of a power supply that i could use to replace the one currently in there. How many users can access HD videos concurrently without delays? Also any configuration changes to the base config that would add to the number of concurrent users. Video sizes are around 200 – 500 meg. That’s entirely dependent upon the bitrate of the videos, and the speed of the network link. When I was with HP we tested 5 simultaneous HD streams but they were relatively low bitrate. Thanks for the unbelievably quick response. It will be a gig network. I was thinking that upgrading the memory to 4 gig and adding an additional 1.5T drive for mirroring would be the only config changes I would need to make to support 6 streams. No writes just video viewing. I would test your scenario before buying any hardware or upgrading as it does void your warranty. Also, you’ll want the dual-core 495 or upgrade the 490 from the default single core. Let us know how it works out. I was thinking the 495 as well. Being from a microsoft background I always worry about memory. I will for sure test. I’ve streamed up to 4 1080p streams (~9Gb each) from my server over gbit. I’ve never had a memory issue (2gb) and I upgraded to the E5700 (3ghz dual core). You’ll be just fine. Is it possible to replace the motherboard with a third party board? I.e. is it a standard size like micro-ITX or is it completely proprietary? It’s proprietary, no way to replace it with a 3rd party board. Anyone know the max memory that the 490 can use? I have Server 2008 R2 core installed on mine and use virtual machines for media streaming, backups, etc.. I’d like to get 8Gb installed and have found a single 8Gb DDR2 chip. Anybody try more than 4gb of RAM? I would like to play my media files on my tv what do i need to get. Nathan There are prolly hundreds of pages about this on this site, but here is how I did it. The easitest way I found is to connect your tv to a upnp device – xbox 360 or PS3 are handy if you have a gaming console already, or Western Digital make some reasonably priced media players which do the trick for less $$$ than a game console. There are many media players out there, the issue being how many different types of medi they can easily encode and decode. The less expensive ones tend to transcode media they can’t handle into forms they can deal with which is problematic if their processors can’t handle big movie files. You hook the smartserver to the media player or games console which is already connected to the tv and the rest is easy. The console/player will generally have a remote that alows the user to browse files on the mediasmart server. The hp server is set to use windows media player and twonky to stream movies to the upnp device but I prefer some freeware server applications like serviio (great), PS3 Media Server nearly as good, and XBMC Media Center (to the xbox what ps3 media sever was to the ps3 – both are capable of working with most upnp devices now and have many great features) For me serviio works best with the mediasmart box. That’s about it. apart from wired or wireless many of the upnp’s have wireless networking if you have a wireless access point on yer home network you will be able to connect your mediasmart server to the TV wirelessly or wired via the rj45 ethernet connection. The basics are simple getting the config that best suits you is just a case of experimenting with the wide range of freeware out there. It’s almost certainly a failed hard drive, check the Troubleshooting forum for related topics that tell you how to resolve it. I have viewed MediaSmartServer.net infrequently (I blame myself). I have an HP DataVault (nie StorageWorks) X510 sever running WHS2011. I’m not a total noob on computer and server hardware, just getting out of my depth – I did upgrade the X510′s CPU to a Q9550S Core 2 Quad processor, upgraded the memory to a 4GB low latency Mushkin stick, and installed the KVM debugging header on the CN9 connector myself to allow my X510 to support WHS2011 – but the Wilstron 532837-ZH1 is still largely a mystery to me. I see in System Information an operational Realtek PCIe GBE Family Controller and I wonder whether there is any way to connect something new to it? If this controller is already providing support for the existing USB 2.0 and/or eSATA ports (soldered connection) then I would probably have to just accept defeat and drop my plans for upgrading this device. What I WANT to do is install a PCI-e Interface internal, 3.5″ Panel, USB 3.0 4-port Hub or something like that that would give me full-speed USB 3.0 SuperSpeed on my now-old X510. There are a few configurations of these USB 3.0 hubs that I’ve looked at but every one requires a connection to a PCI-e connector. Do you have any insight into whether a PCI-e connection can be made? What is the long black slot?/connector? towards the rear of the mobo? I do understand that this motherboard does not provide support for add-in cards. I currently connect a Mediasonic HF2-SU3S2 4-Bay ProBox enclosure via eSATA and I would much rather run a Mediasonic H82-SU3S2 8-bay ProBox via USB 3.0 instead (faster than eSATA and, I believe, 8 drives would be recognized across the USB 3.0 bridge). Last question: I can’t find anything that actually IDs the motherboard form factor of the Wilstron 532837-ZH1, is it a standard mATX or something else? As a future project, just before I outgrow the HP X510 entirely, I would consider replacing the X510 mobo with something more current generation (with native USB 3.0) but compatible. I’m very pleased with the compactness of the HP EX4xx and X5xx servers and their relatively low power requirements. At the time these servers came out, they were a very elegant design. Who would want to walk away from that if you didn’t have to? Thank you for the article. I am replacing the power supply on a 485 and I see it is 3 screws that attach it to the motherboard. This is the best information I have found on the power supply replacement in my search. The USB KVM switches that I’m familiar with require a VGA/DVI connection for video, so no I don’t think this would work.